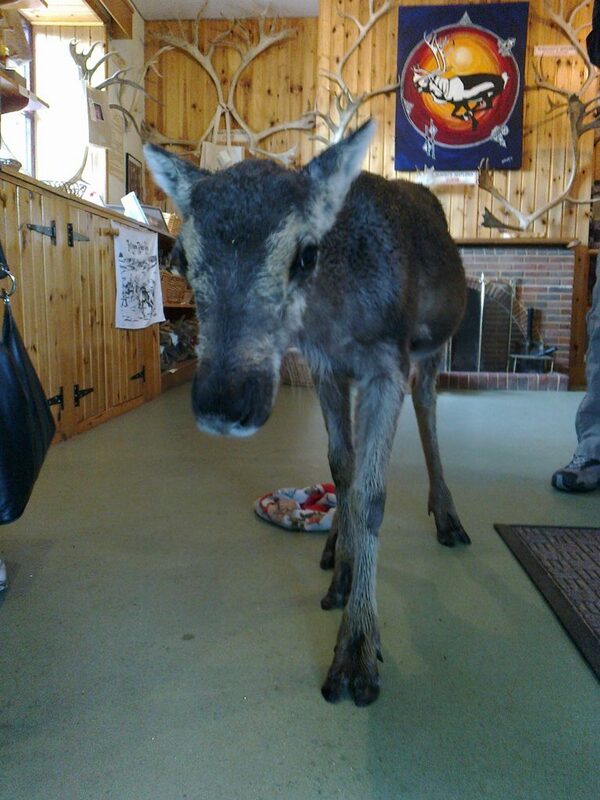 Its well over two years now since Viking was born which also means I have been a Reindeer Herder for well over two years. It was my first trip into the hill enclosure that morning and it was chilly in early May when Fiona and I first caught a glimpse of young Viking. He was white all over and extremely floppy. Proud but casual Mother, Caddis, was right behind the wee man. From then on neither of us has looked back. What great two years they have been. Both Viking and I have been maturing constantly. Keeping fit on the hill and building a real rapport with both staff and visitors. Both Viking and I have developed into real characters with handsome and striking features (haha). Viking has grown a great set of antlers this year and is showing real potential as a dominant male in the herd – I have not. His coat is very light – silvery in the summer and white as snow in the winter. He has some darker patches on his face. My freckles have developed over the summer creating an equally patchy display. All up Viking and I are quite similar and I hope our friendship will continue for a long time yet. The years ahead are likely to be fun for both of us. Lots of work to be done keeping ourselves fit and healthy. The changing of seasons will bring many challenges but the rewards keep us going. During the third year of a males life is when the unfortunate and mildly traumatic process of castration is performed. THIS IS MOST DEFINITELY WHEN WE GO OUR SEPARATE WAYS!! The largest two year old in the herd. Earlier this year we sadly lost Sequin, one of our most well-known females of the herd. Tilly wrote this article about Sequin back in 2015 which we thought we would share once again. Sequin is what we would describe as a ‘normal coloured reindeer’, with a dark back and light sides. However, in contrast, her mother Polo, grandmother Ferrari, great grandmother Vivi, great great grandmother Stina, great great great grandmother Snowflake and great great great great grandmother May were all white or very light coloured reindeer, so Sequin is very much the ‘black sheep’ of her extended family. 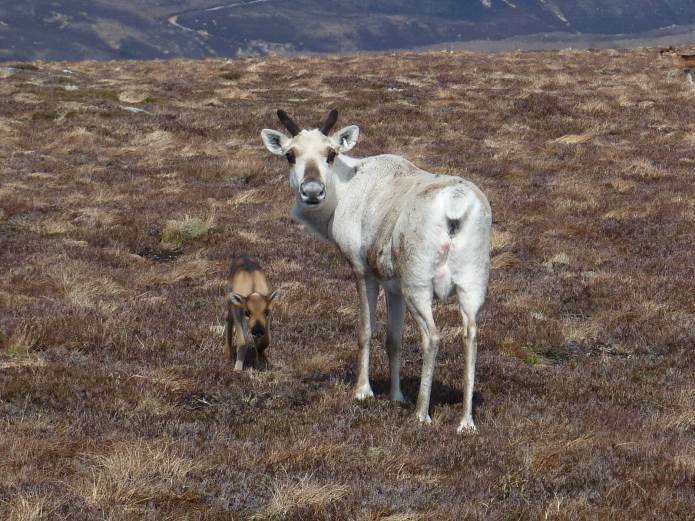 Whiteness in reindeer is a recessive gene and it is interesting to see how that colouring has been so persistent through the generations. 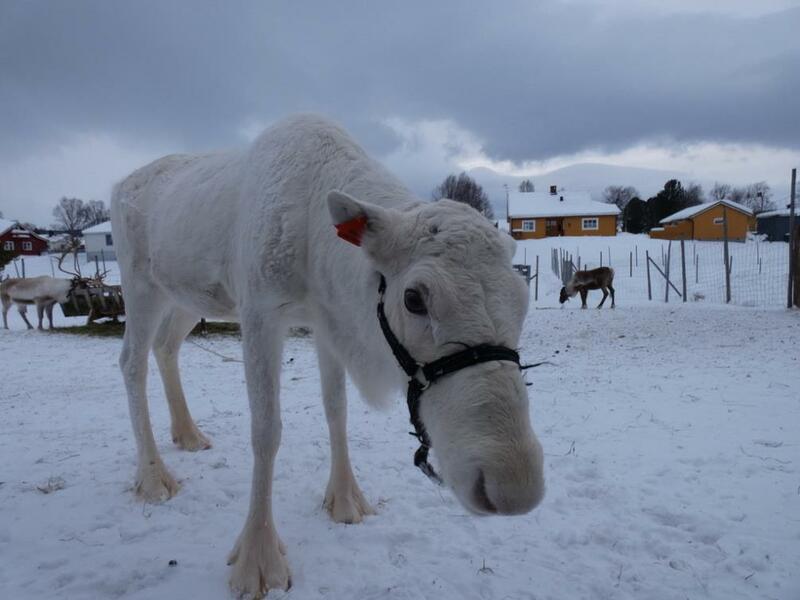 I think this is probably due to Snowflake, who was actually an albino reindeer and must have passed on strong white genes to her daughter Stina. Sequin may be the odd one out in this long line of direct white relatives, but she has passed on the white gene to her 2013 calf Cambozola. 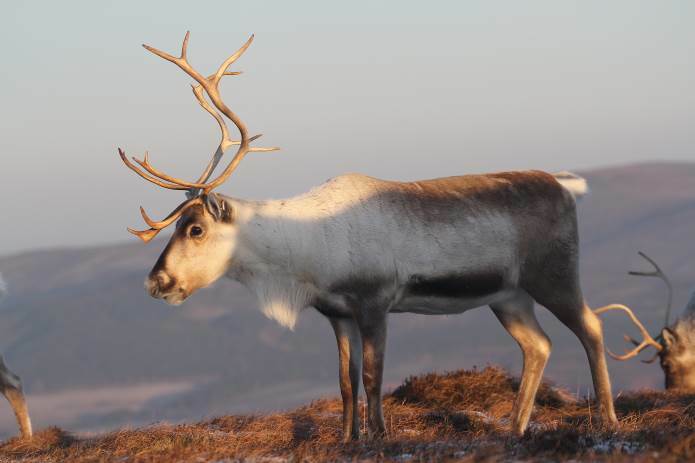 Sequin’s mother, Polo, was an extremely good looking reindeer, who always grew very pretty antlers and, with her good looks, almost regarded her calves as a fashion accessory! Sequin lived up to her mother’s expectations and is definitely a pretty reindeer, although she doesn’t always measure up when it comes to antlers as they have been known to be rather ‘wiggly’ in the past. But that’s maybe due to age! 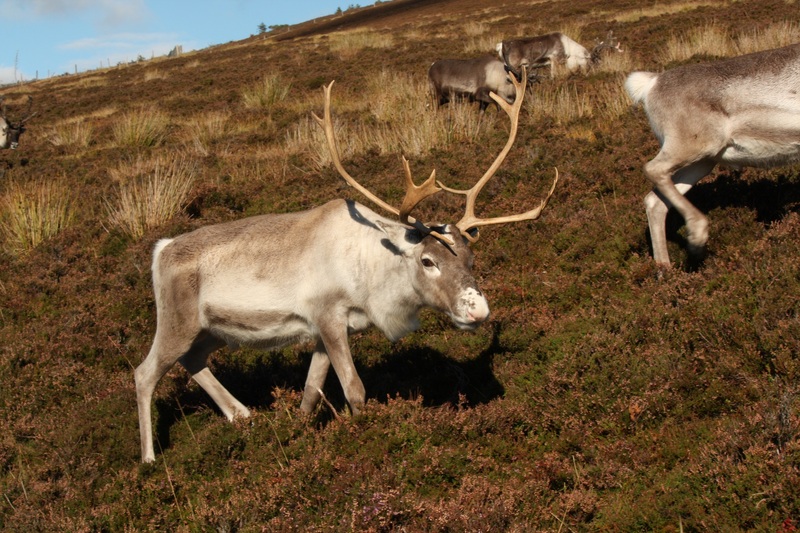 At 13 years old Sequin is now one of our older female reindeer, which just makes me feel old too because I clearly remember when she was born – 2002, the year we celebrated 50 years of reindeer in Scotland. The calves born along with Sequin followed a theme of gold and to this day we still have five other reindeer born in 2002: Haze, Foil, Ring, Lilibet and Bangle. So you may well ask how does Lilibet fit into the gold theme? Well, 2002 was the Jubilee year for the Queen as well as for us, and ‘Lilibet’ was her nickname as a child. Sequin is a real character in the herd; not only does she have four surviving calves of her own – Fern, Stenoa, Cambozola and North – who like their mother are very tame and greedy, but she is a grandmother to Ladybird and great grandmother to Baltic. 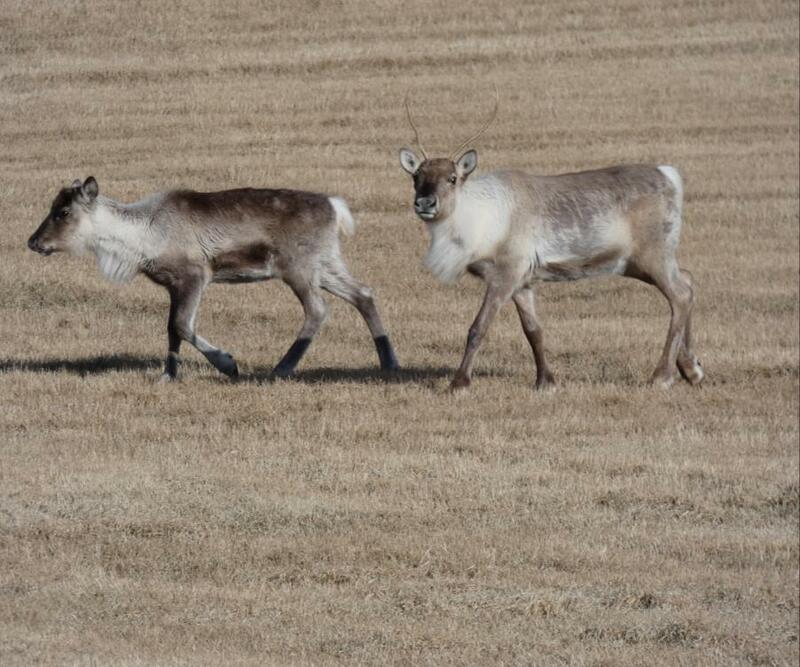 A great family of reindeer in our herd. 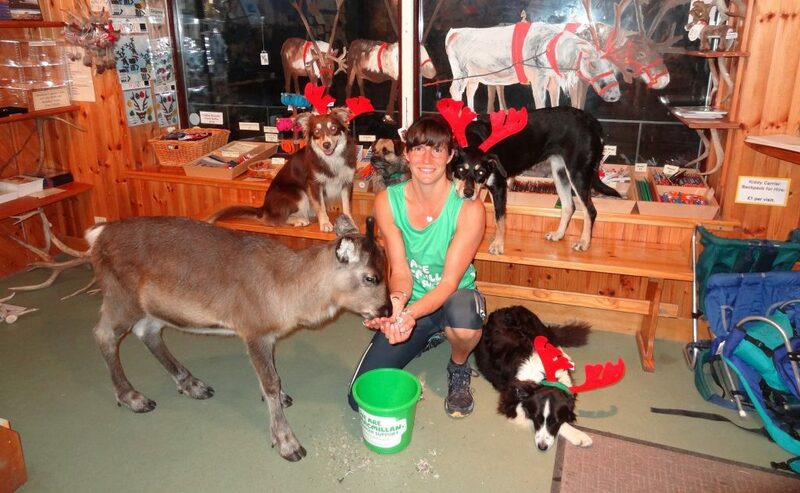 What do reindeer herders do when they meet reindeer when they are travelling abroad? Right, try to get some interaction! After having volunteered with the herd for a couple of weeks at different times last year, I had to finish my studies and for that I needed to do an internship in Norway (I know, poor me ;D). The lovely Trondheim, the town I lived in for 4 months, is surrounded by distant reindeer areas North, East and South of the city. 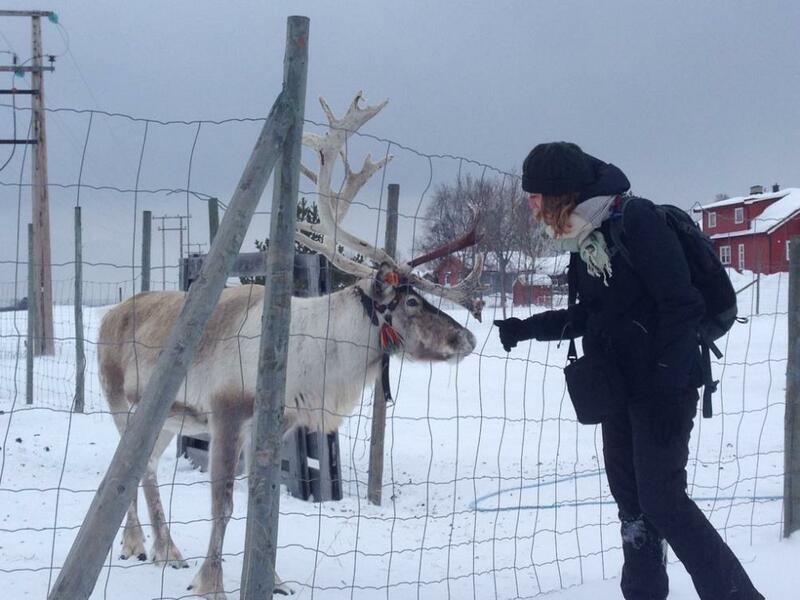 I was really looking forward to meeting some Norwegian reindeer, and since I hadn’t seen them during the first week I was there (I mean, come on, it’s reindeer country!) 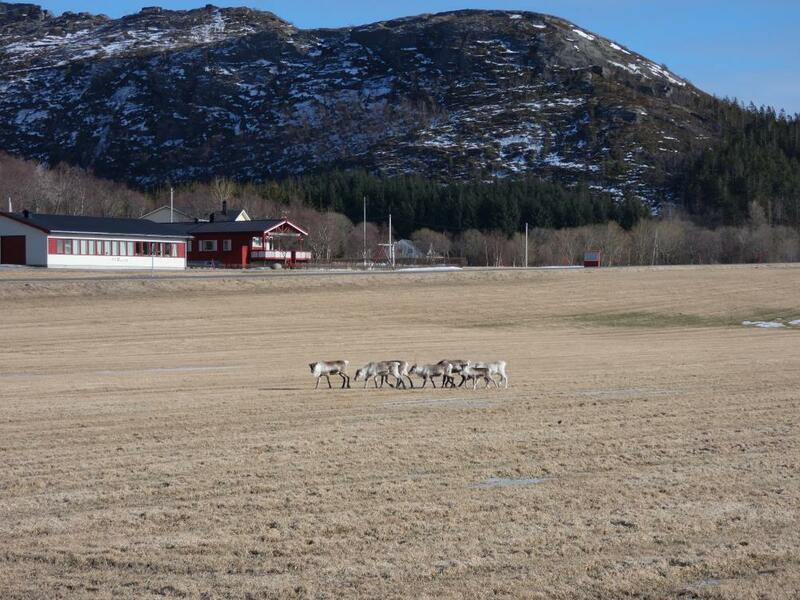 I decided to just go to the nearest herd with a visitors centre, which was at a 2/3 hour drive away from home (practically nothing in Norwegian standards). 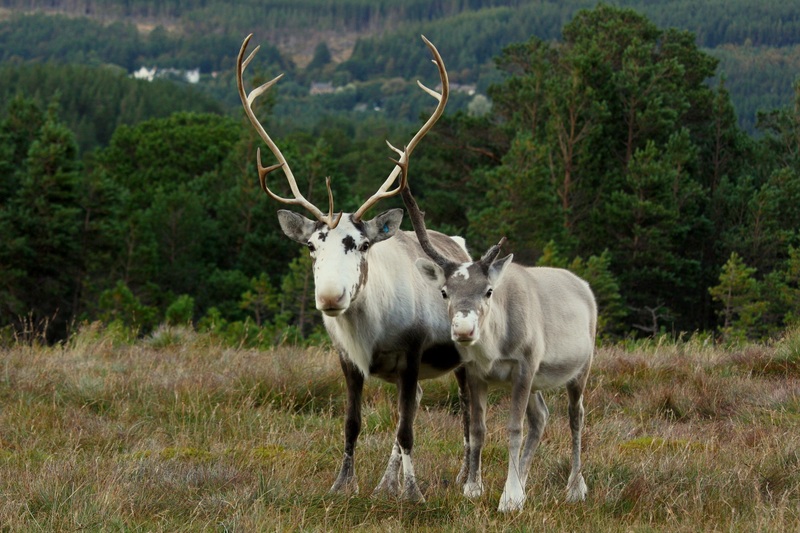 I met some beautiful reindeer behind a fence, but they were a bit far away… Then I got the slightly mad idea of trying to call them over the way we do in Scotland. I started at a very low volume but once I got their attention I decided to go for it, and they all came and meet me at the fence. 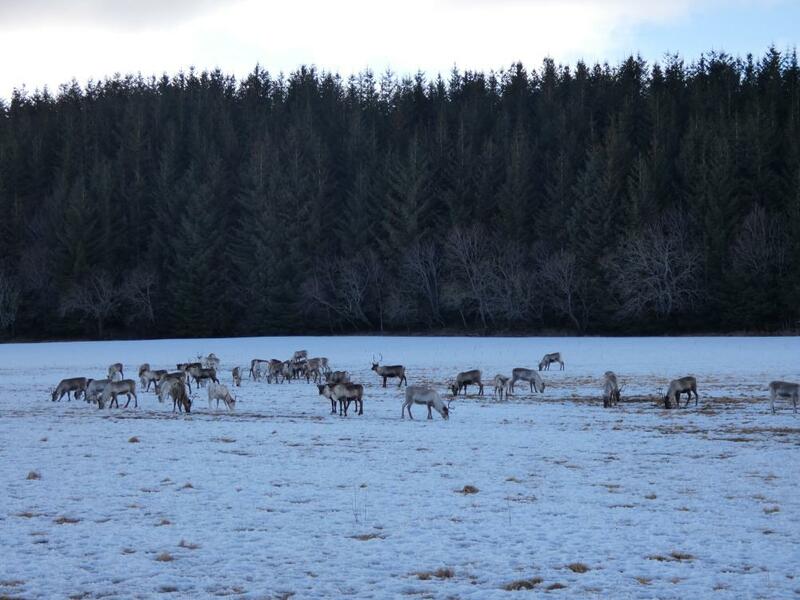 It was really funny to see that these reindeer, so far from our herd in Scotland, actually seemed to react to the call we use there. 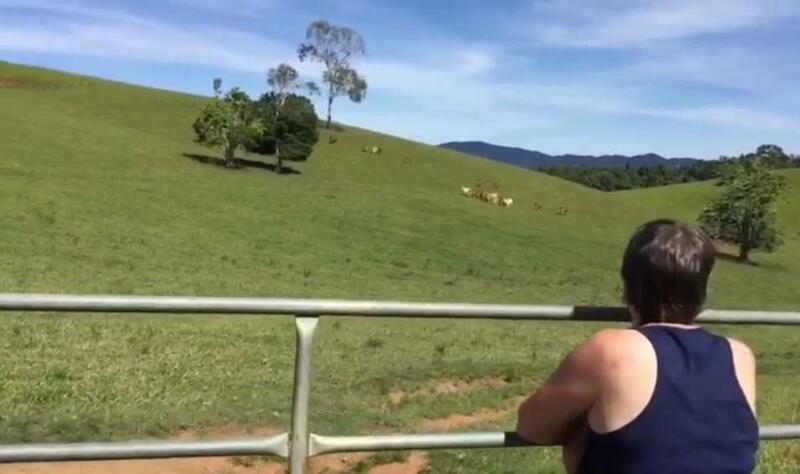 Later on I bumped into a herd that was free-ranging, tried the same thing, and had success again. The reindeer had been lying down, probably regurgitating some food they ate before, and they got up and came running towards me as soon as they heard the call. 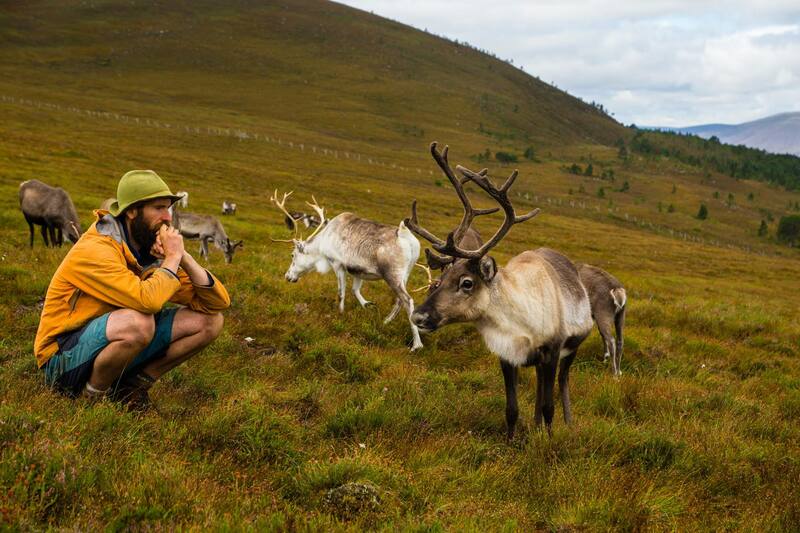 I wonder if the reindeer I encountered reacted because our call is the same call used by Mikel Utsi, the Swedish Sami herder who was the founder of our herd in Scotland, or if reindeer are just greedy and associate human beings that show interest with the prospect of a nice meal! 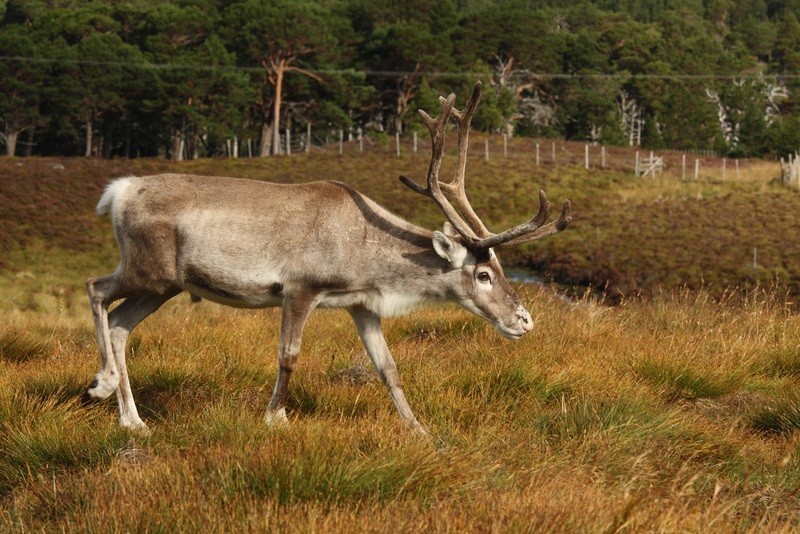 Reindeer sure are keen on their food, and if they can find any way to preserve energy by having it brought to them they are not likely to skip that opportunity. Later on at the centre I told the story to many a colleague and found out that they had tried similar things in other countries. 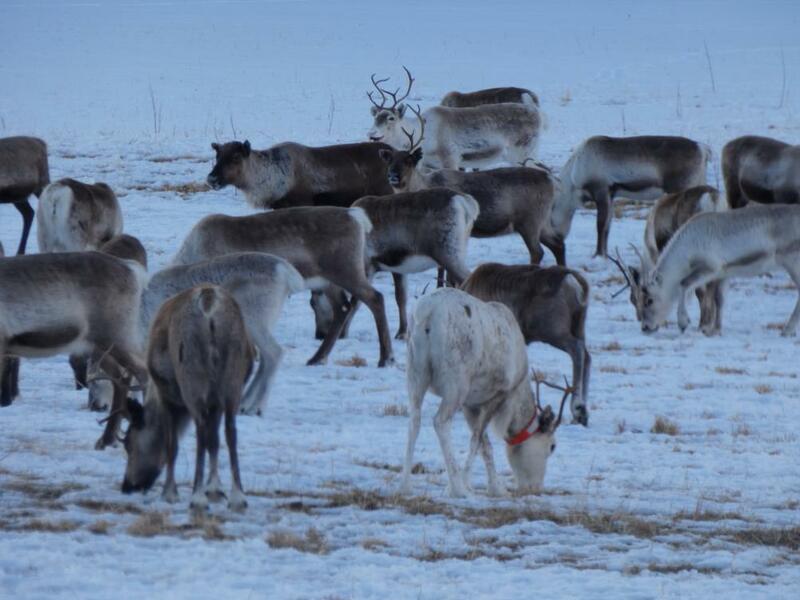 Guess the quirkiness of reindeer herders is just as prominently present as the love for food in reindeer! 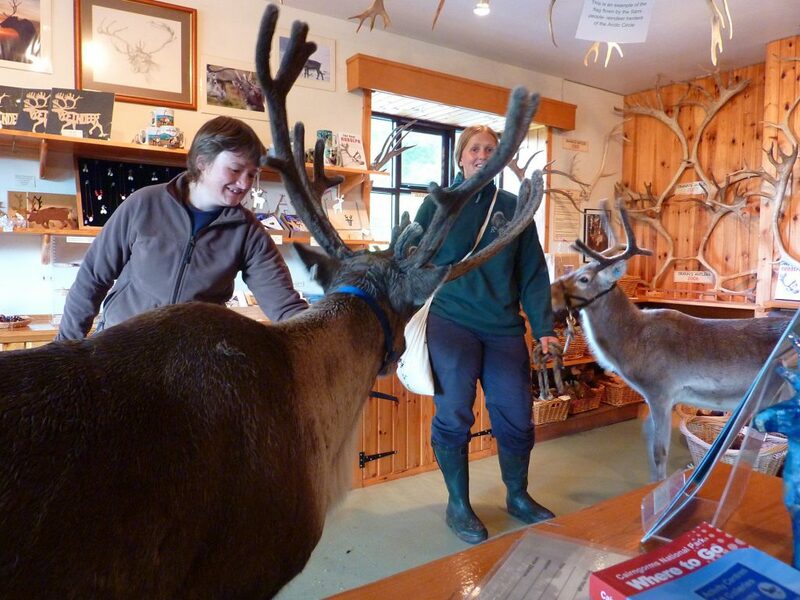 The first association that most visitors have with the Centre is when they come into the shop. 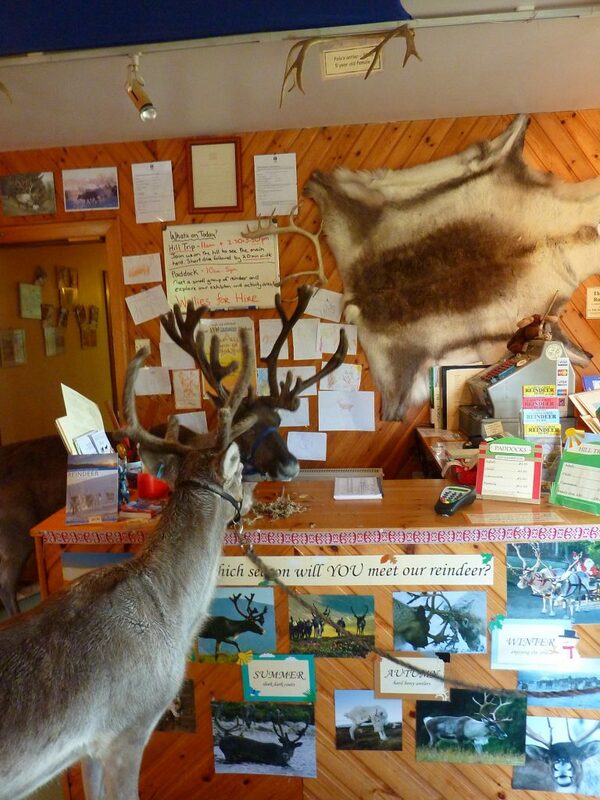 This room is at one end of Reindeer House, and is where we greet visitors, book them onto tours, and provide a selection of souvenirs. 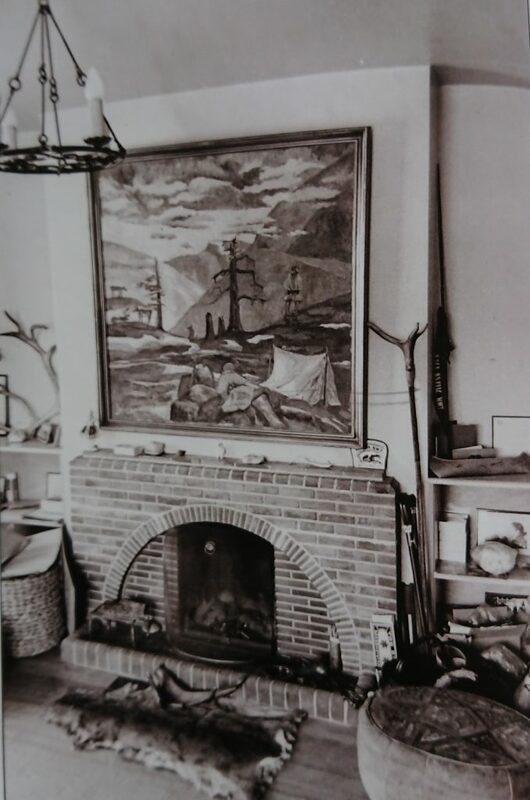 Back when Mr Utsi and Ethel Lindgren first built Reindeer House, this was the room where they entertained guests and had a wood fire burning to provide warmth and cheer. Sami artefacts and pictures adorned the walls. Nowadays our exhibition has outgrown the room and has moved to the Paddocks, and somehow I’ve inherited the responsibility of stocking the shop with (hopefully) interesting things to buy. 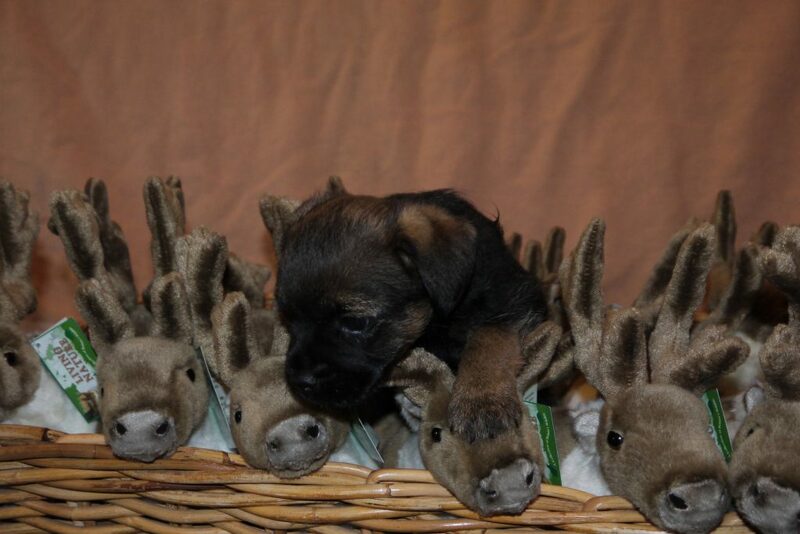 The one rule that I was told by Tilly is that everything must be reindeer-related! We’re keen to keep it a bit different and not just end up selling the same souvenirs as every other shop, so I spend lots of time trying to track down locally made, unique products. It’s lovely to be able to support other small businesses based in the area by buying their products. 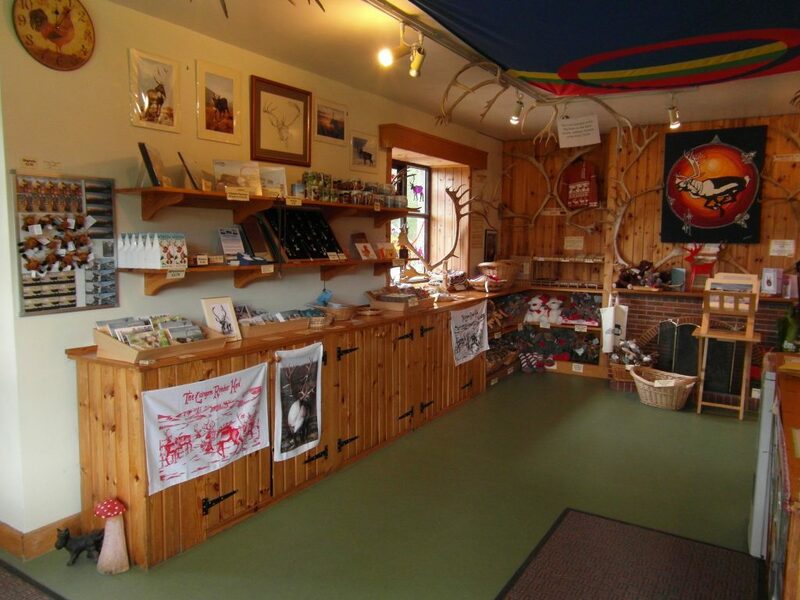 Some of the products are very local indeed – herder Fiona uses reindeer antler to craft jewellery, cheese slices and knife handles, and I dabble in tying fishing flies made using shed reindeer hair. A local photographer creates brooches and pendants with photos of our herd, and green wood worker Wooden Tom makes model reindeer out of branches, complete with removable twigs for antlers. We’ve also recently started stocking a locally made 100% natural midgie repellant, helpful for actually getting out on the hill to see the reindeer (I’ll make an argument for a tenuous link to reindeer!). 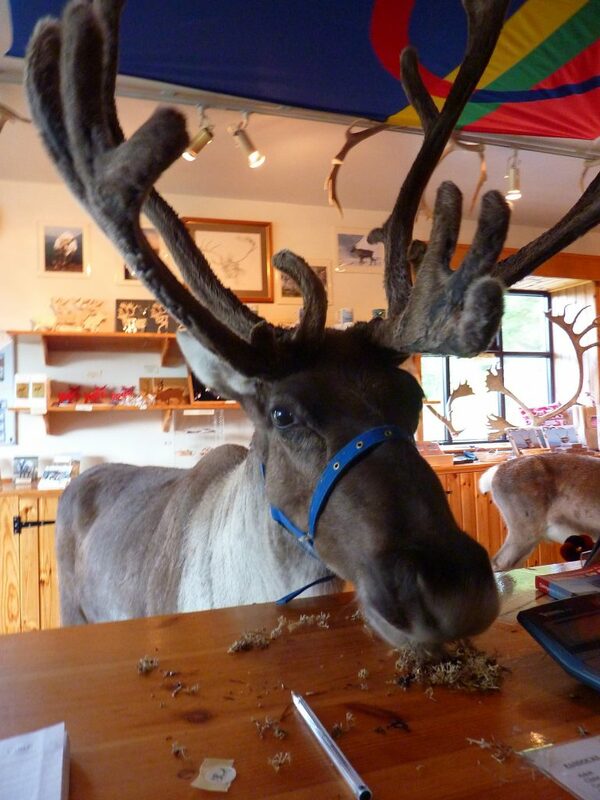 Not called Reindeer House for nothing! Being a bit of a bookworm myself, our book selection is pretty good – including several books written about the Herd, some more general ones about reindeer and the local area, and children’s books. Talking of children, everyone needs a soft toy reindeer, so there’s a choice including some more realistic options and others which focus on being cuddly and cute. It’s certainly the area many kids make a bee-line for, though there is a slight problem that some dogs that are staying with us (especially puppies) will also decide to help themselves if we forget to shut the door! 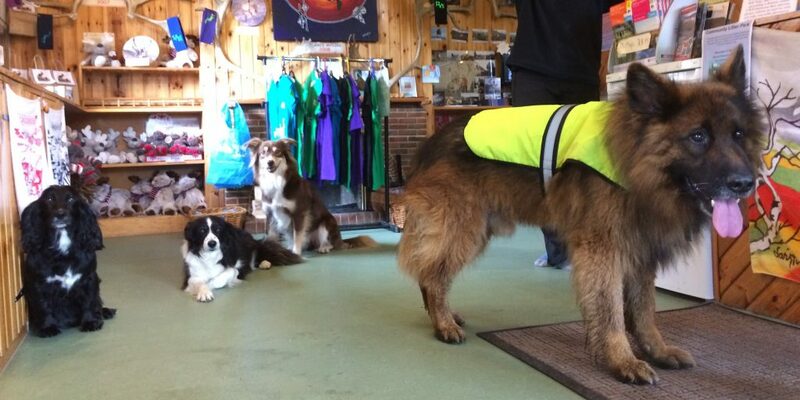 Three dogs and a bear…! 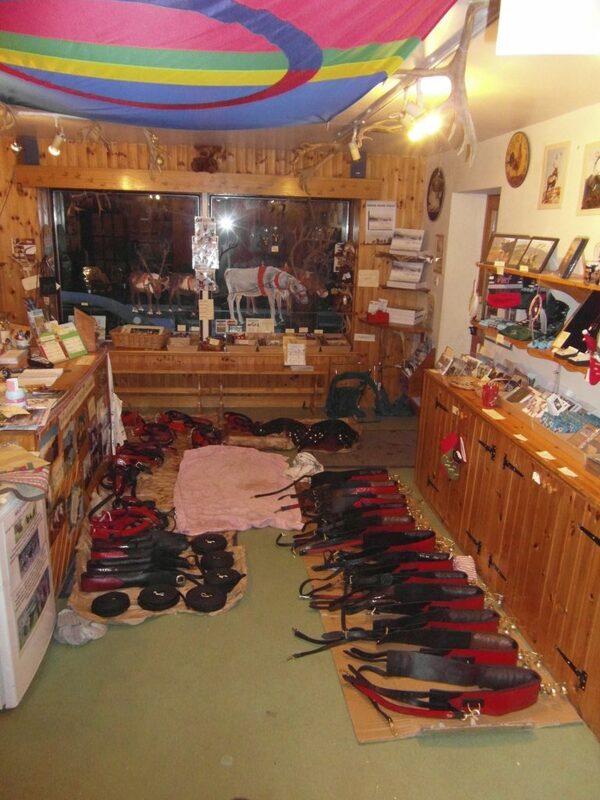 In January we take the opportunity for a deep clean, and also use the floor space for cleaning all our harness after Christmas tour. I do love a nice ordered system and usually commandeer this job! 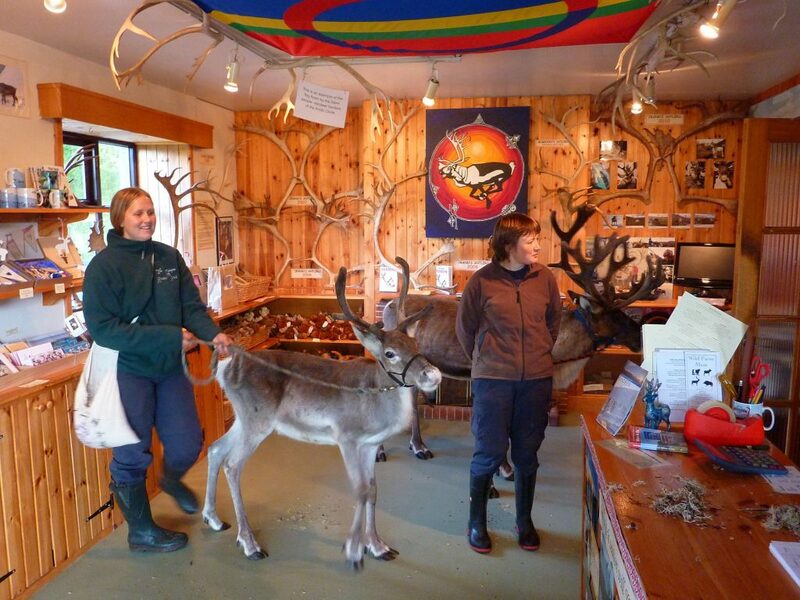 Reindeer House does live up to its name and many of the reindeer have popped into the shop for a few minutes over the years, mostly ones who were hand reared, but also the occasional one who is being trained – just as you expose a puppy to lots of situations to help make them confident and relaxed with whatever life throws at them, calmly introducing reindeer to unexpected scenario helps create a chilled-out individual! 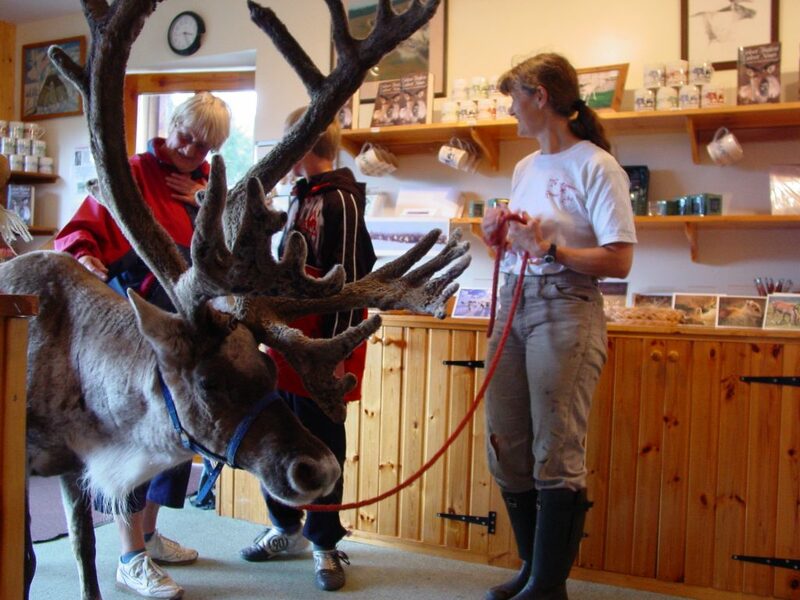 The only problem is that reindeer, with their amazing thick coat, often find it a little warm in there, and after a minute or two need to lose some heat, most quickly achieved by spreading their legs and having a pee!